General information about EZ Street cold asphalt. Compare EZ Street cold asphalt to hot asphalt and conventional cold asphalt. 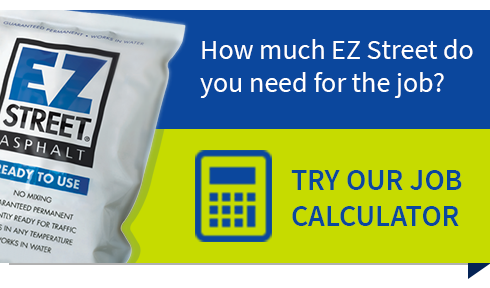 Learn how EZ Street can save on asphalt repair and road repair. EZ Street is permanent and eliminates the process of applying a temporary cold patch only to return and reinstate a permanent hot asphalt patch. Three EZ Steps to install EZ Street cold asphalt, sweep, fill, compact! See how EZ Street cold asphalt stacks up against conventional cold patch. From a production perspective, EZ Street cold asphalt relies on strict quality control mechanisms to ensure the premium blend is achieved. Here what people are saying about EZ Street cold asphalt. EZ Street works in water! EZ Street cold asphalt works in water, even fully submerged potholes! Hot asphalt and water just don't mix, but EZ Street cold asphalt simply displaces the water. Patch water-filled potholes in a flash.